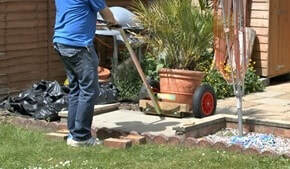 Do you need to move large, heavy, awkward to handle plant pots?. Doing it manually is just near impossible and back breaking! We have the answer!. Whether you are a plant nursery or an avid gardener with a garden decorated with large pots, our heavy plant pot mover will suit your needs.The Plant pot trolley is favoured by garden centres and plant nurseries as well as home owners with large gardens. 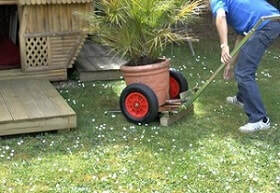 ​With the pot trolley mover 1 person can load and move up to a 160 litre nursery pot. 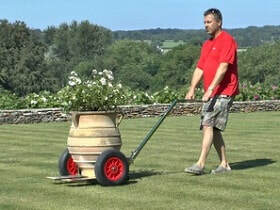 Whether the nurseries or garden centres are delivering pots to customers or the home users need to put their plants out after the frost or bring them in before winter sets in, the reduced width feature can enable the pot mover to pass through a side gate with ease, but still handle a round pot with a width of up to 620 mm. NB:- The internal dimension is in between the legs. IMPORTANT - measure the plant pot width at 14 cm from the base as the legs are this high, therefore the pot can taper to a wider dimension once above this height. It is also worth mentioning at this point that you don`t actually have to get the pot fully between the legs to lift and move the pot plant (see attached videos, the 130 & 160 litre size pots demonstrate both these points! The Heavy Pot Movers are a simple, yet very effective way of moving and transporting heavy, large and awkward to handle potted products of difficult shapes and sizes such as semi-matured trees and larger potted plants and shrubs. The pot mover has been designed for both the professional and domestic user handling pots up to 160 litres. Note: The leg height is 140 mm, therefore you MUST take you pot dimensions from this height, however you do not have to have the pot completely in between the legs, about 2/3rds on. 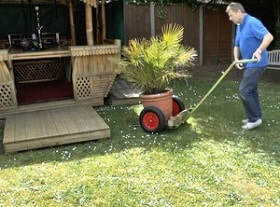 "We have a sizable garden with many large plant pots that we struggle to move at any time, now thanks to your ingenious, yet simple designed plant pot mover with the adjustable legs I can move the pots without troubling our younger family relatives to help (very awkward and back breaking task normally). Thank you Keith for your expert advice on the pot mover, we couldn`t live without it now, please feel free to use us as a reference for any future customers, thanks again"